What cable do I need to download data to my computer? The MC-100 uses a standard mini USB to USB cable to download information onto the computer, one is included with purchase. The included cable is all that is needed to connect the meter to a computer. Once connected the meter comes up like a flash drive in a folder. A calibration is required every time the unit is turned on before the unit will take measurements. The calibration process checks that the sample chamber is clear (by making sure the signal strength is strong enough to take measurements) and provides the meter with a 100 % transmittance baseline. Is this a SPAD meter? 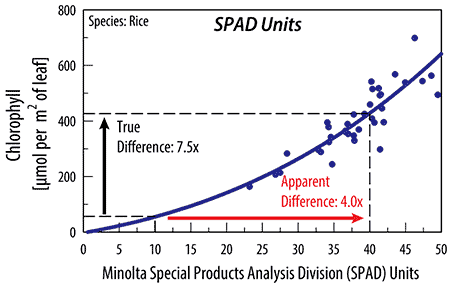 No, this is not a Minolta SPAD Meter; however, the MC-100 can be set to output SPAD units instead of concentration (µmol of chlorophyll per m-2 or chlorophyll content index (CCI) units. What units does the meter measure in? The default setting on the MC-100 takes leaf measurements in chlorophyll content index (CCI) units. The major benefit of the MC-100 is the ability to set output of the meter to display in chlorophyll concentration units (µmol m-2). There are concentration output settings for 22 specific plant species and a separate conversion setting for use with any species that is derived from the average of all 22 species. For reference and comparison purposes, the Apogee meter can also be set to output relative units in CCI or SPAD. How do I adjust the contrast on the screen? To darken the displayed text, press and hold the up arrow. To lighten the displayed text, press and hold the down arrow. What should I do if I hear beeping when pressing buttons on my meter but the screen isn't displaying anything? The most likely issue with the meter is that the screen contrast has been adjusted click here for instructions to correct the issue. If the problem remains, please contact technical support. What is the smallest leaf I can measure with this sensor? The meter measures chlorophyll concentration over two areas. What should I do if my meter has inconsistent readings? Moisture or debris on the MC-100 diffusers (the white discs in the sample chamber) is a common cause of inconsistent readings. If cleaning is required, organic deposits are best removed using water or isopropyl alcohol and a soft cloth or cotton swab. Never use an abrasive material or cleaner on the diffuser. Please use caution when cleaning to avoid accidental removal of the diffusers. What should I do if my meter will not work or will not power on? The first step is to try replacing the battery. The MC-100 is powered by a 9 V battery. If this doesn't work, try performing a master reset by removing the 9 V battery, holding down the power switch for 30 seconds, reinserting the battery and powering on the unit. If you are receiving an error code please refer to the troubleshooting and customer support section of the manual. I received an error code on my meter. How do I fix the error? Error codes and their corresponding fixes can be found on the Troubleshooting and Customer Support section of the manual. How do I calibrate my meter? The MC-100 requires calibration when taking the first measurement after powering on the unit. To calibrate the meter select "Run" then "Measure" then "Calibration". Before depressing the measurement arm check that the sample chamber is clear, then hold down the arm to calibrate. Important: Continue to hold down the arm until the screen says "Release Arm". While the meter is calibrating the screen will display "Calibrating. Wait! Status: Busy". After the calibration scan is complete the screen will display "Calibrating. Wait! Status: Release Arm" at this point, release the arm. The meter is now calibrated and ready to take measurements. My species isn't listed in the MC-100. Will the meter still work for me? Yes the MC-100 has a generic setting with an equation made to fit to all data (the equation is an average for the 22 species listed in the MC-100). This setting can be found in the menu as "GENERIC". 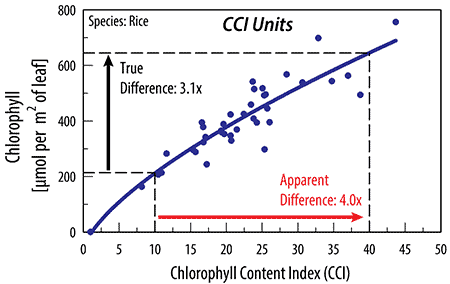 For what species does the MC-100 directly determine chlorophyll concentration? The MC-100 has equations for the following species: Rice, Wheat, Soybean, Barley, Pepper, Tomato, Pea, Kohlrabi, Lettuce (cultivar Waldman's Green), Lettuce (cultivar Buttercrunch), Corn, Sorghum, Quaking Aspen, European Birch, Paper Birch, Crimson King Maple, Norway Maple, Japanese Maple, Boxelder, Crab Apple, Purple Leaf Sand Cherry, Lilac, and Forsythia. If your species is not listed above, the meter has a generic setting that uses an equation made to fit to all data (the equation is an average of equations for the 22 species). This setting can be found in the menu as "GENERIC". How do I convert from µmol m-2 to mg m-2? The reading in µmol m-2 can be converted to units of mg m-2 by multiplying by 0.9. The reverse conversion from mg per m-2 to µmol m-2 can be done by multiplying by 1.11. How does the MC-100 work? The MC-100 uses LEDs that emit specific wavelengths in the red and infrared ranges. The detector analyzes the ratio of the two wavelengths to determine chlorophyll concentration index. This index is then converted using equations derived by scientists at Utah State University to output chlorophyll concentration in µmol m-2 of leaf surface. Detailed information on how the MC-100 works can be found in the manual, by viewing Apogee Chlorophyll Meter Quick Overview, or by viewing MC-100 Chlorophyll Meter in Depth. How do I use the field of view reducer? To use the reducer you must calibrate the meter without the reducer installed. Installing the reducer prior to calibration will result in an error message to clean the sample chamber. Note: Field of view reduction errors were less than 5 % for all leaves tested using the steps below. You are now ready to make measurements on smaller leaves. *Note: If the meter turns off steps 1 thru 2 will need to be repeated before making a new measurement. To remove the reducer, carefully use a needle to depress the foam washer and pick out the reducer from the sample chamber. Many hand-held chlorophyll meters used by researchers output a relative index that is non-linearly related to chlorophyll content; Chlorophyll Content Index (CCI) and Special Products Analysis Division (SPAD) are two common indices used by these meters. Measurements made using a meter that outputs a relative index are not equal to the actual chlorophyll concentration in a leaf, therefore, doubling the reading displayed on the meter does not equal a doubling of chlorophyll concentration in the leaf. 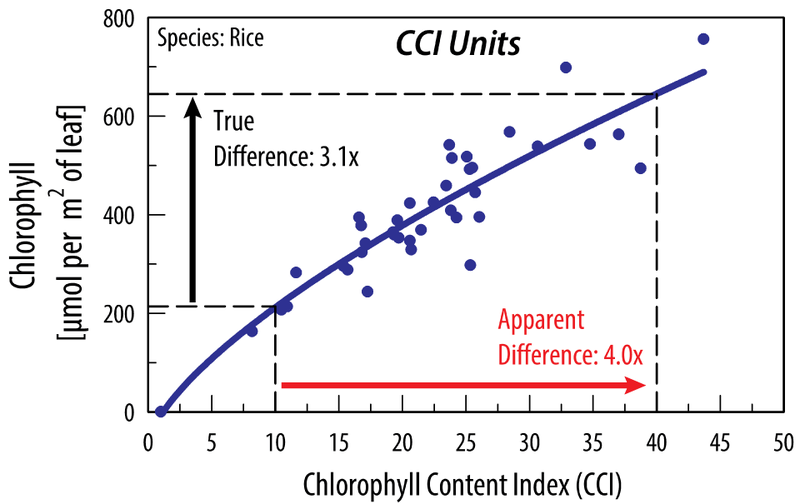 While it is possible to convert the relative indices to chlorophyll concentration using experimentally determined equations for you specific plant species, Apogee’s MC-100 Chlorophyll Concentration Meter measures chlorophyll concentration directly and can also provide readings in both CCI and SPAD index.